The Vegetarian Family Cookbook, but she made an exception for this clever combination of couscous and tiny shell pasta. Personally, I'm a big sucker for cutesy names, so I'm glad she did. 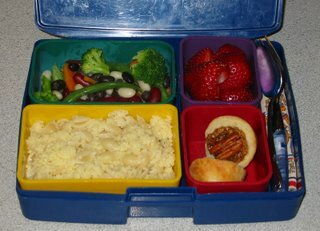 Next to the "seashells in the sand" is a dish of cooked frozen bean and vegetable medley (broccoli, carrots, and green, black, white, and kidney beans) and fresh organic strawberries. For dessert, I baked miniature pecan tarts. This was "take two" on trying to make a pecan pie with only barley malt syrup for sweetener. I came up with the idea during our attempt at a sugar-free Lent, but learned the hard way that barley syrup bubbles up to an alarming degree when baked. Verdict: The tarts were a success -- nutty and chewy with a hint of cinnamon, and not teeth-shatteringly sweet like regular pecan pie (oh, how I love it). Just a few bites of shells and veggies were left. 4 stars. P.S. As an update to yesterday's Zaru Soba, shmoo had soba for dinner and lunch, and wants to know if I can make it for dinner again! He never goes on "food jags" where he wants the same thing over and over (this is the boy who once walked in the kitchen at breakfast and whined, "Aw, pancakes again?? We just had them yesterday!"). So I am amazed. 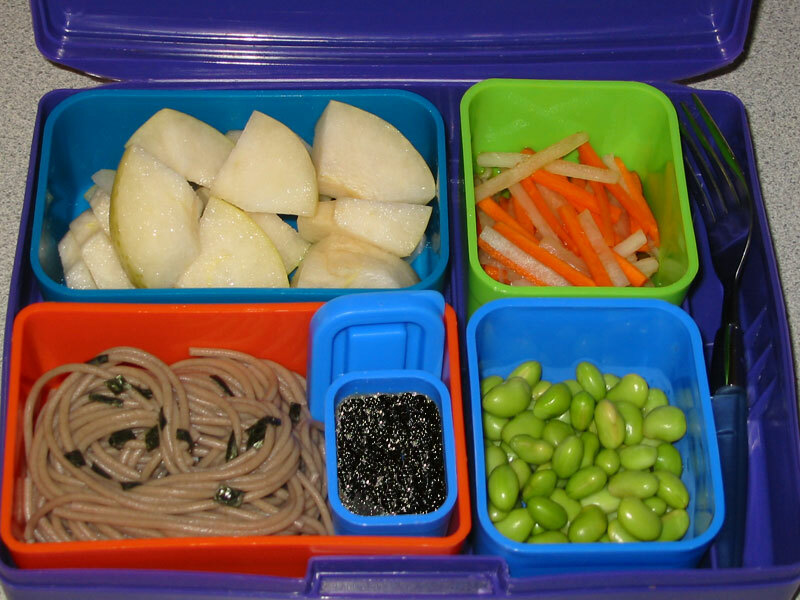 Zaru soba is like the sleeper hit of the lunch box. Cookbook author Madhur Jaffrey calls zaru soba -- cold buckwheat noodles -- "one of the joys of a Japanese summer". I love her description of slurping icy soba noodles on a shady bridge over a mountain stream in Kyoto. Jaffrey's recipe for zaru soba and homemade dipping sauce (made from shiitake mushroom broth, soy sauce and mirin) appears in her breathtakingly good book World Vegetarian. Traditionally, the cool buckwheat noodles are scattered with bits of nori seaweed and served with a bowl of sauce on the side. Diners season the dipping sauce with wasabi, daikon, etc., and the noodles are dipped and eaten. For the lunch box I put the sauce in a tiny container and shmoo poured it over the noodles instead. On the side are edamame and daikon namasu (chilled giant radish and carrot salad), a recipe from Japanese Vegetarian Cooking. For dessert, an Asian pear. Oh, and gluten-free readers take note: although I used noodles made from wheat and buckwheat, I noticed that Eden Foods makes gluten-free buckwheat noodles. Verdict: Shmoo wasn't too keen on the daikon (don't listen to him, the salad was fantastic -- the best daikon dish I've ever eaten). Shmoo loves these noodles so much he wants to know if we'll take him to Japan for his birthday. Um, I'm afraid that's a little over our birthday budget for this year. But I can make more zaru soba! 5 stars. 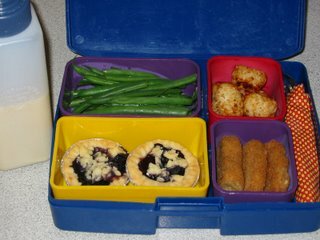 More Chicken-Free Nuggets today, along with organic tater tots and blanched green beans. For dessert I baked two of the tiniest blueberry pies you'll ever see, using eensy little pie tins. Blueberry season is fast approaching, and I wanted to tell you all about Polly's Perfect Blueberry Pie now so you'll be ready. This is a fantastic pie recipe we came across two years ago. It's ideal for those who don't like making and rolling out pie crust. The crust is mixed right in the pie pan -- you press the pie crust into the pan and the pieces that fall over the sides are used as a crumble crust on top. How brilliant is that? It's easy to veganize by using nondairy milk, and I just leave off the bits of butter on top of the pie filling, but you could use margarine. When fresh aren't in season I use frozen (not thawed) blueberries instead, and bake the pie about 10-15 minutes longer. Oh, and the beverage today is shmoo's new favorite nondairy milk -- oat milk! Verdict: The pie pans came back empty, but the fork and spoon were still mysteriously clean, wrapped neatly in their napkin. "How did you like the pie?" I asked. "How did you eat the pie?" "I just scooped the pie out with my teeth." Oh, my. "Show me how the piggy eats." My husband has also enjoyed these past couple days, with brioche and blueberry pie around the house. He didn't face plant into it, though. 4 stars. It's so nice having a mom that cooks as much as I do. I call her out of the blue and ask, "Mom, do you know where I can get some tiny brioche pans?" "Sure," she says. "I've got a few dozen, what size do you want?" I veganized a standard recipe for brioche (an eggy, buttery yeast bread from northern France) by substituting almond milk for milk and Earth Balance for butter. My favorite egg substitute in yeast breads is 2 TB mashed potatoes (per egg) and a pinch of turmeric (for color). I love the soft tenderness that mashed potatoes give to bread dough. 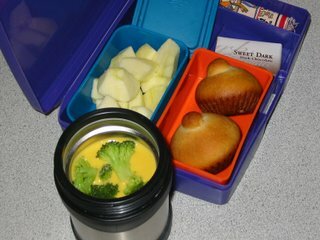 In the thermos is some Broccoli Cheez Soup, one of our favorite recipes from Jo Stepaniak's Ultimate Uncheese Cookbook. For dessert, an apple and half a Newman's Own Sweet Dark Chocolate bar. Verdict: The brioche was so buttery, light, and soft! I hope someone is working on a vegan french cookbook (Mastering the Art of Vegan French Cooking? What would Julia Child say?) All but a few bites of soup were gone. 5 stars. Welcome to Monday! Today I made caramelized tofu, one of our all-time favorites. I fried squares of firm tofu until golden, then glazed them with a mixture of brown sugar and soy sauce. I packed the tofu next to some basmati rice, and topped them with a sprinkle of toasted sesame seeds. 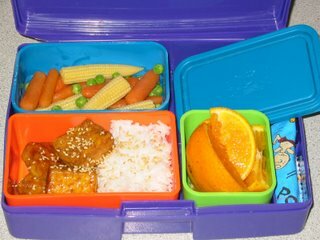 On the side is a dish of "Baby Carrot and Baby Corn Stir-Fry" from The Vegetarian Family Cookbook by Nava Atlas. For dessert, a honey tangerine. Verdict: I was excited to finally get some baby corn into the lunch box; it seems so perfectly lunch box-sized. 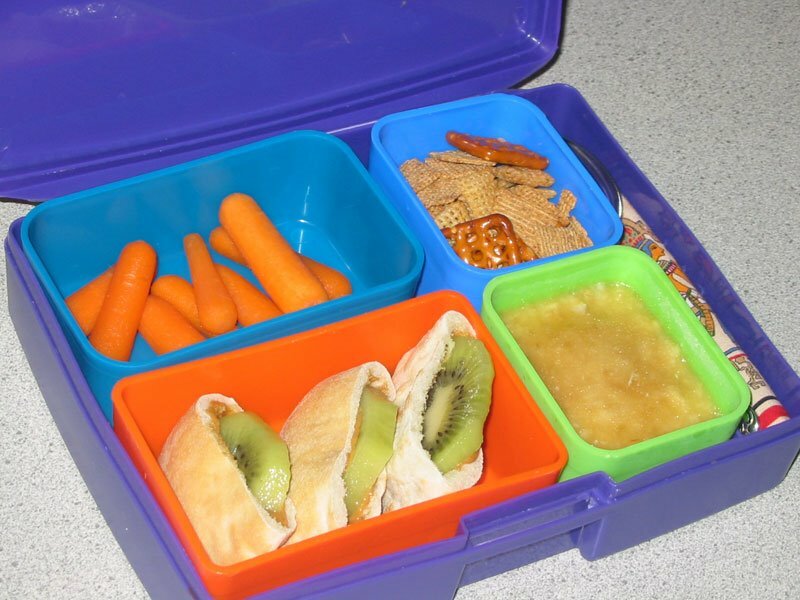 And mixing baby corn with baby carrots was certainly inspired (thanks, Nava!). Shmoo seems to have played with the corn more than eating it -- cutting it into pieces, eating the kernels off one like corn-on-the-cob, etc. The tofu was a hit, as usual. Although it's not in the picture, shmoo asked for a tiny container of soy sauce at the last minute, so he could sprinkle some on the rice and veggies. 4 stars. 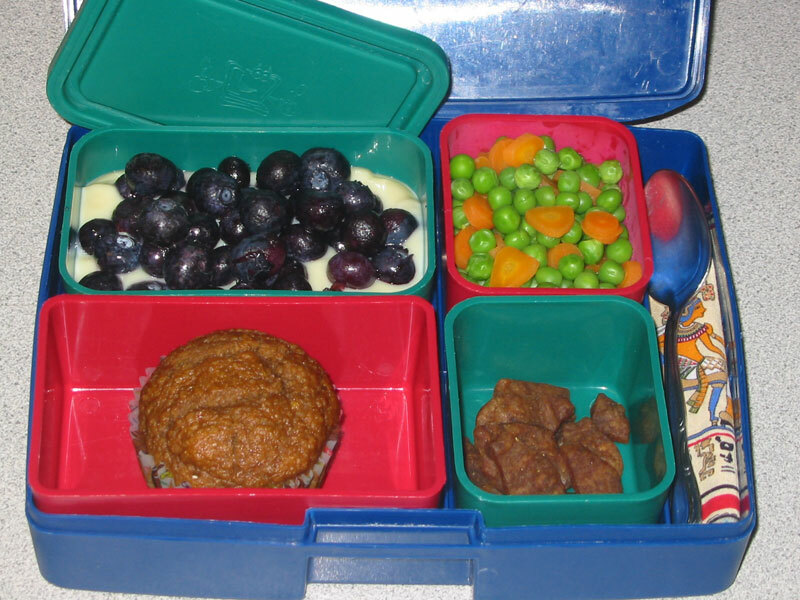 Lunch Box reader Céline was kind enough to send me her veganized version of Banana- Molasses Muffins from The Vegetarian Mother's Cookbook (2 tsp. water in place of the egg, and strawberry soy yogurt instead of plain). They have now become a favorite of mine, especially since they call for blackstrap molasses -- a great vegan source of calcium and iron. Thanks, Céline! 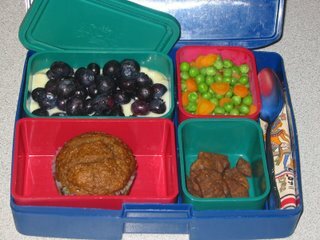 Alongside the muffin is some Stonewall's Teriyaki Jerquee, peas & carrots, and a lime soy yogurt topped with frozen blueberries. Verdict: Since I made the muffins the night before this was a nice, easy lunch for a busy Friday morning. Shmoo ate the top off the muffin and left the rest behind. Yes, we all know that's the best part! 4 stars. It's that wonderful time of year again -- we just bought our first bundle of locally-grown Washington asparagus! Local asparagus season is like an annual celebration in our family. As soon as the farmer's market opens we start buying enormous bagfuls of the stuff, eating it lightly steamed with a dab of margarine, stir-fried with sesame oil and soy sauce, creamed into soup, even pickled (well, really just my crazy aunt likes it pickled). First, blend 6 oz. (half a box) of soft silken tofu until smooth, and set aside. In a medium saucepan whisk together 1/3 cup sugar and 5 TB cornstarch. Pour in one 14 oz. can light coconut milk (I used Trader Joe's brand) and cook, stirring or whisking constantly, over medium-high heat until thick. Fold in the tofu, 1 tsp. vanilla, 1/8 tsp. coconut extract, and 1/3 cup finely shredded coconut. Pour into six mini graham pie crusts and chill. 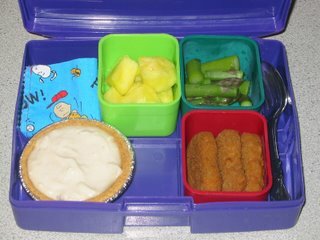 Verdict: The pie was sturdy enough to travel well in the lunch box, covered with a bit of plastic wrap and nestled in place with crumpled parchment. Shmoo loved everything! 5 stars. A simple homemade potato-carrot soup in a thermos for lunch today. In the lunch box I packed homemade crispy croutons and a tiny container of Bac-Os (yes, indeed, they are vegan!) to sprinkle on top of the soup before eating. 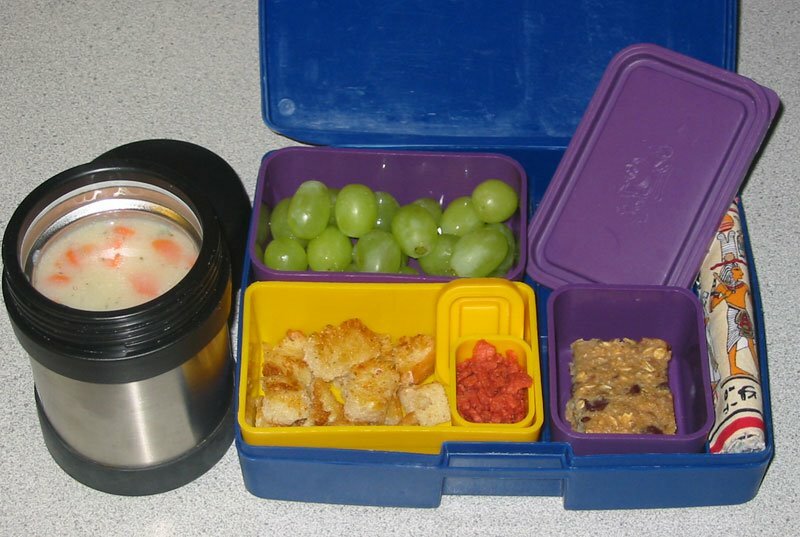 For fresh fruit and dessert, green grapes and a Chocolate Chip Bake-At-Home Oatmeal Energy Bar. Verdict: Did bacony Bac-Os make every bite better? "They gave me Bac-O Burps," shmoo reported. "Oh, bad?" "No! It was g-o-o-d good. I had Bac-O Breath!" Every last bacony bite was gone. 4 stars. P.S. Another noon release tomorrow. See you Thursday! You know, if I never tried anything again after not liking it the first time, I wouldn't be eating tofu today. So despite our horrid experience with Tuno, here we are giving it another shot! Shmoo continued to ask about Tuno each time we went to the store, and although tofu and chickpea salad sandwiches are nice, they just didn't seem fishy enough to make him happy. 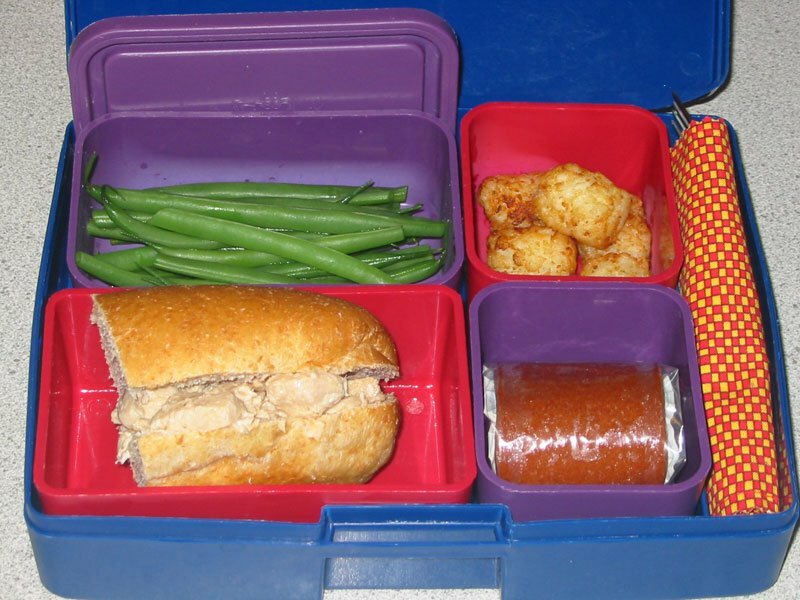 I think seeing one of his close friends eating the real thing in class each week has kept it in his mind (speaking not as a vegan but as a mother, I am shocked to see so that so many parents still feed their kids tuna; I worry about mercury contamination, but perhaps news of the risk is just not getting out there to most parents?). So we gave Tuno another go, trying it here at home over spring break before putting it in the lunch box. I heeded the advice of a trusted friend and Tuno enthusiast, and rinsed the Tuno extremely well under cold running water and let it drain (this is so key). Then I mixed it with just a small dab of Vegenaise and nothing else. Many of you recommended pickle, but shmoo is strongly anti-pickle. I spread the Tuno salad on half a wheat roll and packed with lightly blanched fresh green beans, organic tater tots, and an organic raspberry fruit leather. Verdict: Tuno, you have indeed redeemed yourself and I'm sorry for all the bad things I said about you. After rinsing and draining it, it really does taste and look like tunafish! Shmoo was happy to finally have a sandwich just like his friend's, and ate every last bite of his lunch. 5 stars. More fun with mini-pitas today! This time I filled the pitas with peanut butter and kiwi fruit, an interesting alternative to jelly. Above the pitas are baby carrots and some "Savory Baked Cereal Mix" from my newest cookbook acquisition, The Vegetarian Family Cookbook by Nava Atlas. I used two types of organic square-shaped cereal mixed with pretzels and nuts. Below the cereal mix is a "frozen banana custard". I got this idea from my friend Renee's booklet The Happy Lunchbox: mash a banana, mix it with 1 TB orange juice (I used fresh), and freeze it overnight. Put it in the lunchbox in the morning, and by noon "it will have thawed enough to taste like a rich banana custard." I'm interested to see how this turns out! Verdict: I volunteered at school today and sat next to shmoo while he ate. Kiwi pitas got a big "Mmmm!" and vanished quickly. He also loved the cereal mix. It's like a kinder, gentler Chex Mix -- not too salty or spicy. The banana custard was creamy and slushy and looked like applesauce. It tasted good, but shmoo gave it a thumbs down for being "too stringy". Maybe if it were blended in the blender instead of mashed by hand? 3 stars. P.S. Tomorrow is a noon release day. Happy Easter, and we'll see you on Monday! "Where can I go to talk more about veganism?" As those of you who read the comments may have noticed, I decided to disallow anonymous posters. Some of us (vegan and not vegan) have been having a hard time getting along and being respectful of each other. Most of the nastier comments seem to be coming from anonymous posters, so I apologize to all the friendly, polite posters who will have to take the extra time to register. I hope you do, because I really do welcome friendly thoughts, comments, suggestions, and questions. I believe in open debate about the larger issues of veganism. I just don't know if my lunch box blog is the place to have these big, worked-up discussions. Someone nicely suggested that I start a forum, but I've realized after reading all these posts that I don't have the time, Solomon-like wisdom, and thick skin that it would take to become a forum moderator. There are some great discussion boards out there. VeggieBoards is a large group that I've heard good things about. 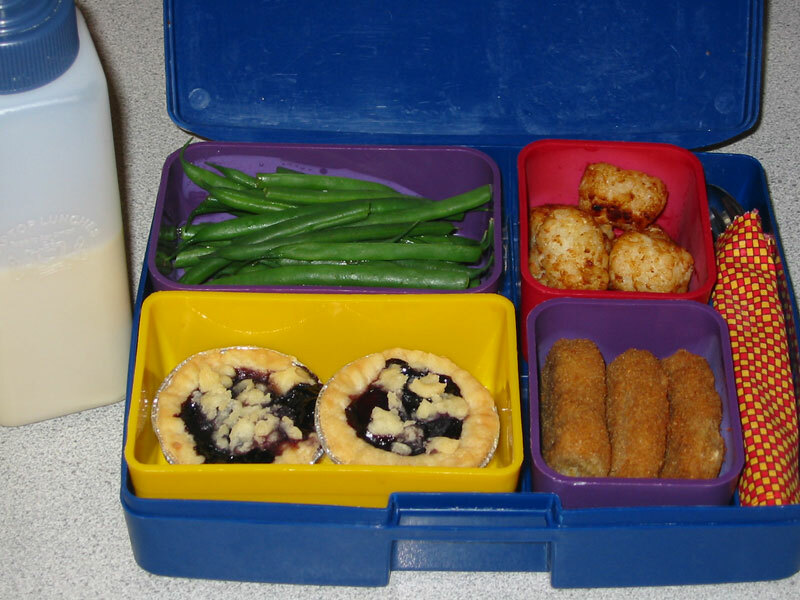 Before I got busy with the Lunch Box, I used to hang out at Vegan Freaks and Post Punk Kitchen. Does anyone else have a favorite forum they would recommend? This lunch box is a cheerful celebration of springtime (and the fact that we gave up giving up sugar for Lent, ha!)! Here's an English muffin masquarading as a sunflower (vegan cream cheese and dried pineapple with currants and sunflower seeds in the middle). The lovely flower has attracted a following of Honeybee No-Bakes that can’t wait to take a taste (follow the link to get the recipe -- you could even shape them into eggs for Easter). On the side is a sprout salad with shredded carrot, mandarin orange segments, and a tiny container of orange vinaigrette. And what would an Easter lunch box be without a plastic egg filled with vegan candy? Watch out when choosing jelly beans, as many contain gelatin and/or beeswax. These Starburst Jelly Beans are vegan and easy to find in most supermarkets. Verdict: Shmoo likes helping me grow sprouts more than he likes eating them. He wolfed down the no-bakes almost as fast as I could shape them. 4 stars. Anyhoo, along with my Happy Mini-Pita Dance I'm doing the Guinea Pig Shuffle: Matisse & Jack asked shmoo and I to try out their TrailBlaze Bake-At-Home Oatmeal Energy Bars -- you add applesauce to a dry mix, stick it in the oven, and take out a batch of vegan "energy" bars without the wrappers. Today we tried Cranberry Walnut. 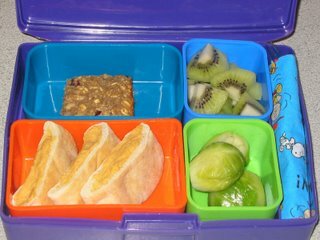 I packed them along with kiwi fruit and Brussels sprouts (there were four but shmoo nicked one to eat with breakfast). Verdict: First, the bars: they were absolutely effortless, cheaper and more eco-friendly than prepackaged bars, and tasted good (can't wait to try the chocolate!). One criticism I have is that the bars contain whole flaxseeds; flax needs to be ground in order to become bioavailable, so those lovely omega-3s are going in one end and right out the other, and getting stuck in my teeth along the way. Only one mini-pita was left uneaten. 4 stars. Hey, we're back to school! I hope everyone (who got one) enjoyed their Spring Break. It was a cold & rainy one here, but we still had fun with soccer camp, play dates, and spring cleaning. Today I made aloo samosas -- Indian pastries filled with potatoes, peas, and spices. They are normally deep fried, but I bake mine instead (I'll say it's to cut down on the fat content, but it's because I'm lazy). 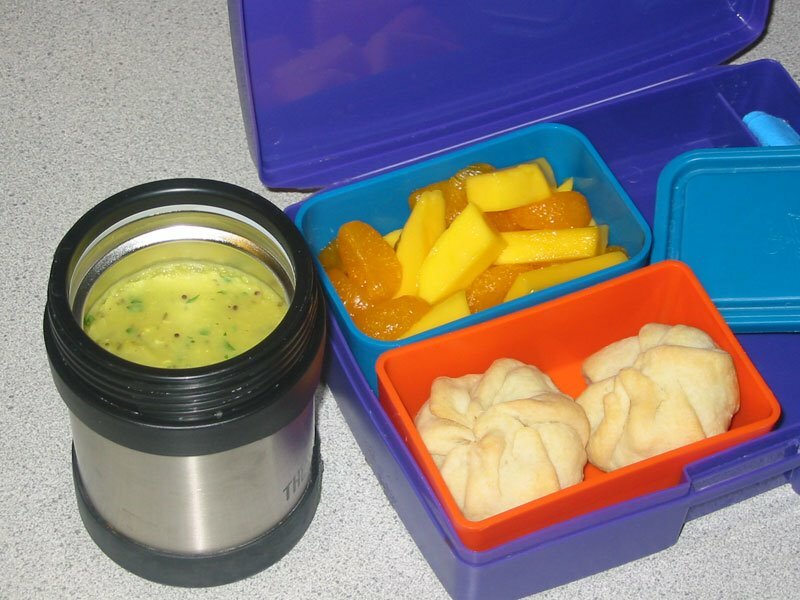 In the thermos alongside is a hot serving of mung dal -- split, husked mung beans cooked and seasoned with lemon, black mustard seed, and fresh cilantro. And for fruit and dessert today, a fresh honey mango sliced and mixed with drained, canned mandarin orange segments. I love the way the orange colors look together. Verdict: Once again, food stuffed in pie dough reigns supreme! Every bite of aloo samosa was gone, along with all the fruit (mango and orange are a great combination). He only ate about half the mung dal. If only it had been wrapped in pastry... 4 stars. Some of you have already been discussing this below, but I wanted to create a special post to talk about vegan Easter egg ideas. Instead of real eggs we usually use plastic eggs filled with little candies, confetti, stickers, or dry cereal (kids can break their eggs into a bowl and eat the cereal for breakfast). In the comments below Veganmum shared this great idea: "make little 'nests' by mixing melted chocolate with shredded wheat or shredded coconut (or both), and use the mixture to line paper muffin cups. Chill until set. 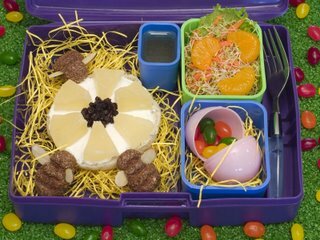 Fill the 'nests' with a few vegan eggs or jelly beans, and hide these or just put them in your child's Easter basket." Thanks, Veganmum! 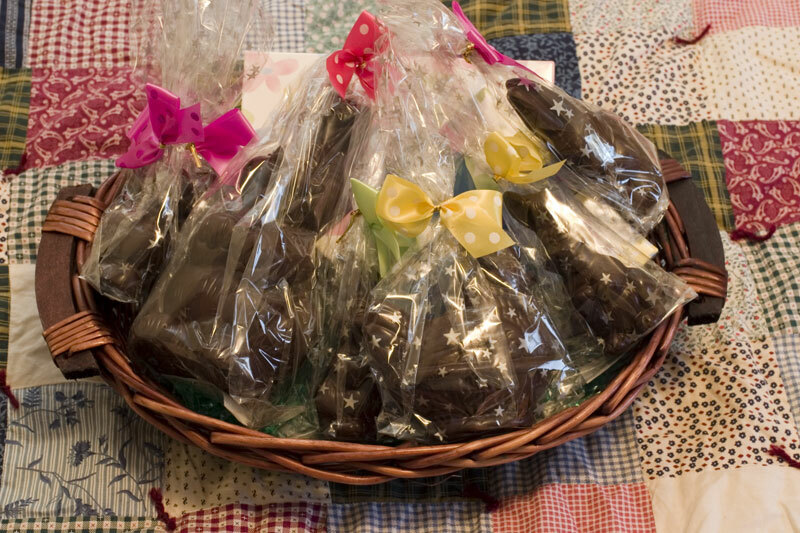 One year we made no-bake clay eggs using instructions from PeTA's Cruelty-Free Easter page, which also includes instructions for papier-mâché and chocolate eggs. The clay was easy to make and fun to paint. Because they never go bad like regular eggs, we spent the next couple weeks hiding them over and over again. 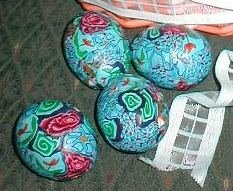 I also stumbled across directions for making these gorgeous Millefiori Eggs (pictured above) using wooden eggs and polymer clay (follow the link and scroll down for instructions). Of course, you can also bake and decorate egg-shaped cookies, or paint paper or wooden eggs from a craft store. In another comment below Beth suggested finding pretty egg-shaped beach rocks for painting. Eggs are universally used at Eastertime as a symbol of rebirth and springtime, but you could always get away from the whole egg-thing altogether and hide little toys around the house instead. This year we'll be hiding little sets of Pokemon cards tied with pastel ribbons (don't tell shmoo!). Check out Mr. Fruit Bunny! I discovered his cuteness in the latest issue of Taste of Home, and was immediately struck by what a great, healthy, vegan-friendly idea this was for Easter. The creator says, "I’ve taken it to school functions and gotten rave reviews from the youngsters." What I want to know is, how does she manage to transport Mr. Bunny so he arrives in one piece? I would probably make this fresh on location instead. I want to send out a great big thank you to the folks over at Fatty Weight Loss. They had volunteered to send a box of Godiva chocolate truffles to the winner of the Best Food Blog award, but were kind and thoughtful enough to realize that a vegan probably wouldn't want Godiva truffles! Instead, they sent me this incredible Easter basket overflowing with vegan chocolates from Rose City Chocolatier. Even the smell of all this chocolate is enough to make me swoon. It's filled with seven chocolate bunnies and chickies and two boxes of mixed chocolates. We're saving it for Easter and calling in family reinforcements to help us eat it all. First I want to thank everyone out there for not ripping me to pieces for showcasing a product that turned out not to be vegan -- I feel so bad! As someone pointed out, Dr. Fuhrman's Pixie-Vites contain the variety of vitamin D that comes from sheep's wool. Although I always try to be careful and read labels, I completely failed to notice this one. 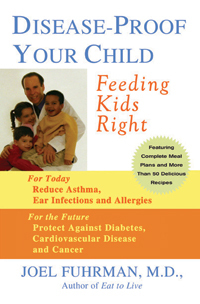 I contacted Dr. Fuhrman right away and asked about the Pixie-Vites. You can visit the Disease Proof blog to read his response. The reason why the Vitamin D in Pixie Vites is not vegan and made from wool (please note it is not made by killing animals) is because that form of D is twice as absorbable as the vegan type and many kids do not eat a whole Pixie Vite and only take a small portion of one. I did not want to short change some kid by not supplying them with adequate D, so I let that one non-vegan ingredient slip by (since it is made from a by product of wool manufacturing).